So in March of this year Preston started piano lessons and silly us, we just signed him up without owning a piano or keyboard :) Not sure what we were thinking?? So now what...he's loving his lessons and we have no piano. Determined not to spend a lot of money, I hopped on Craigslist one day and there it was... an ad that said "free piano" and the location was only about 4 miles from our home. So I immediately called Grant and decided we should just go get it and decide if it would work for us later. So we did. And this is what we came home with...womp, womp. And here's my happy little pianist. The piano's new home is in our front office, so below are a couple of pictures of how our study currently looks. I think it's a good fit in this space. And then here are a couple more pictures of the finished product. Another before and after side by side. I also reupholstered the piano bench with a much prettier fabric. Back soon to show you a little bit of how we tackled painting this piano. *Update: You can click here to see our painting and reupholstering process. Beautiful!! It truly looks gorgeous - can't believe you got it for free! Absolutely perfect!! What a great idea and I love the cushion too. We always talk about getting a piano, what a smart way to do it! Thanks for sharing. Wow! What an amazing transformation!! You did a great job! It's really pretty now - the color makes it feel modern. Way to upcycle a freebie! Absolutely gorgeous! I love painted pianos! Love how it turned out! The whole office is just gorgeous! Color me green! Tried to talk the Man of the House into letting me bring home a free piano a couple months ago. It didn't fly. Yours turned out so lovely! Wow! Looks so lovely! I love that area, it is so calm and peaceful and beautiful! Looks amazing! What a great find. That piano looks amazing! I love all white rooms! What kind of plant do you have in the vases? They look so chic in a white vase all by themselves! I have no idea what the name of the plant is, but I've had in potted in our home for years now and I'm always cutting it to add some green to my pictures. The cuttings last forever after I cut them too, so it's pretty awesome! If I find out the name I'll let you know. Does anyone know what it's called? It is a difficult decisión to paint a piano, but you made a great job. Love the color. I love it, I love it! 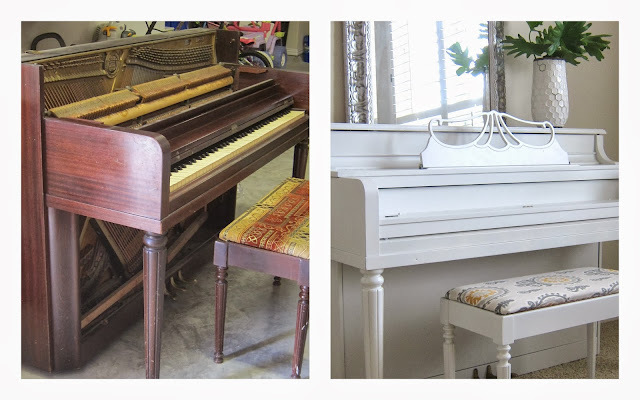 I so want to paint our piano but am so scared! It's mine from when I was a kid, but it's not a super expensive piano by any means. You just gave me inspiration thank you! That turned out amazing, love the white sooo much!!!! nicely done Becky, the white makeover made all the difference! Gorgeous! Seriously. Can you please come do my house? :) I can't wait to see how you did it...I am now searching CL for a free piano of our own! You did an awesome job with this piano. Best of all it is being used and is beautiful again. It seems like it might turn have turned into a family heirloom. How did you get the missing pieces? Did you make them? Everything came together so well, and now you have a happy pianist. Oh my goodness, what a beautiful transformation! Wow, what a transformation!! Beautiful!